Have you ever loved a recipe SO much that you made it multiple times in the course of a couple of weeks? It all started when I had a bunch of pumpkin puree left over in the fridge after making some of these No-Bake Pumpkin Spice Cheesecake Cups (which are totally worth the extra pumpkin leftovers). You know when a recipe only calls for a quarter cup of pumpkin and then all of a sudden you’re left with a ton of pumpkin puree that you have no clue what to do with? Well, I just so happened to be flipping through the Fall edition of the Better Homes & Gardens magazine that my husband picked up for me when he went to the hardware store (thoughtful guy!) 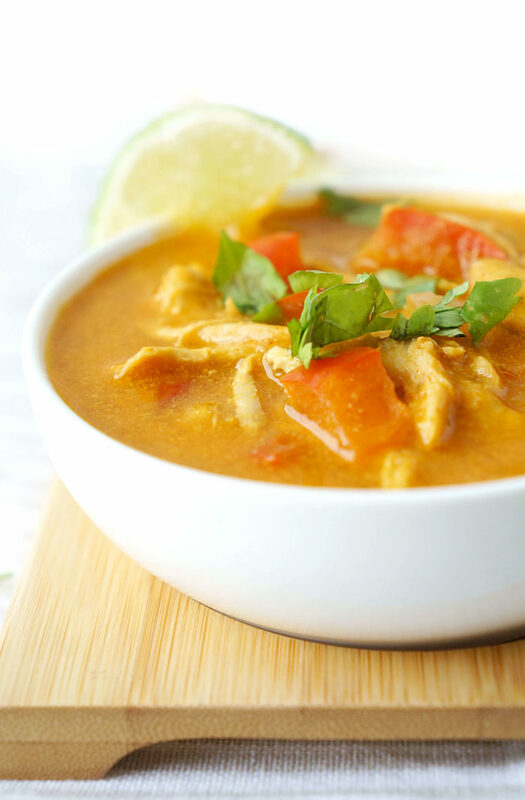 and came across a curried pumpkin chicken soup recipe. I’m not gonna lie. At first, I thought it was kind of a funky combination. Pumpkin and chicken? Does that even go together?? In my mind, I just couldn’t imagine what it would taste like. But I REALLY wanted to use up the pumpkin puree, so I thought, what the heck. I have all of the ingredients. I’ll try it out. 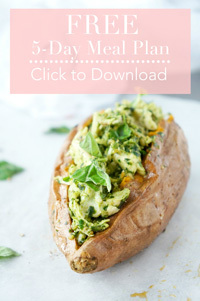 I made quite a few modifications to the recipe and was pleasantly surprised when it turned out to be really delicious. Like not even a little bit delicious. So much so, that I made it three times and ate it six times over the course of the last two weeks. I even apologized to my husband for making it so many times, but he didn’t seemed to be too phased by it because, as it turned out, he really liked it too. 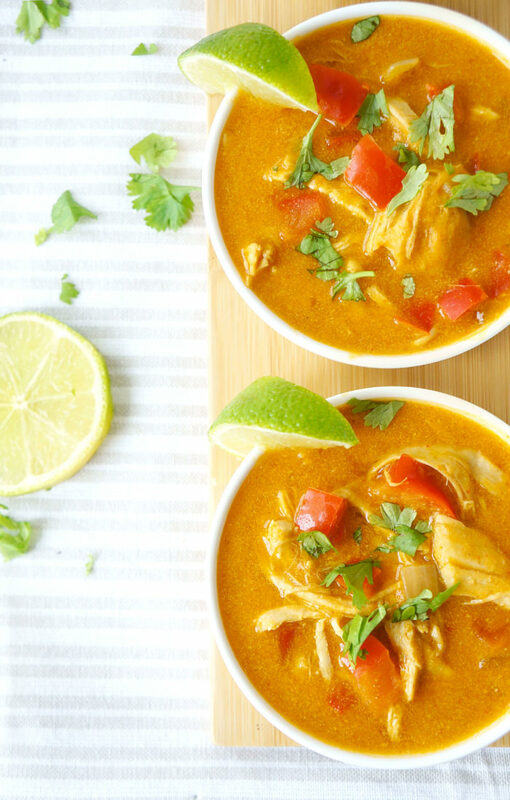 The best part about this Curried Pumpkin Chicken Soup is that it’s REALLY easy to make. In fact, it’s so easy that I had memorized the ingredients and made it off by heart. Aren’t those the best kinds of recipes? 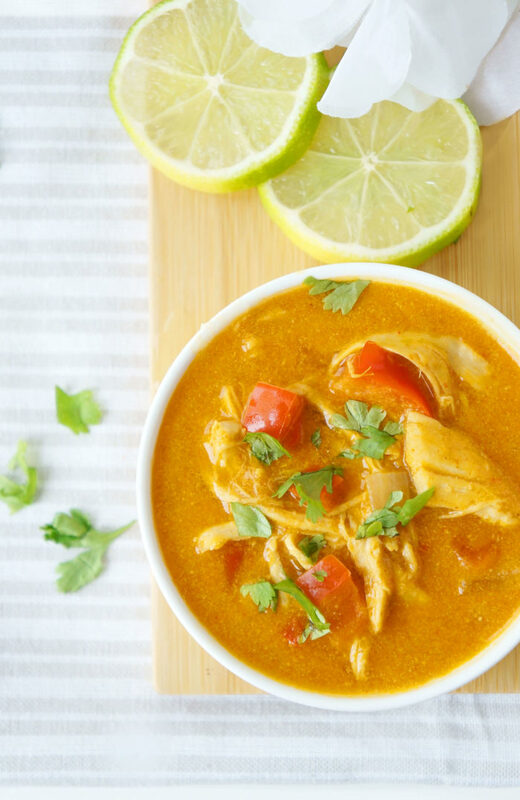 It’s also amazing because you can spruce it up with lots of toppings like cilantro, diced avocado, a squeeze of lime juice, or some homemade crispy tortilla strips or pita chips. My mouth is watering just thinking about it. And I just ate it for lunch. The pumpkin in this recipe increases the fibre content to 4 grams per serving, which can help promote that feeling of fullness and also aid in weight control and overall digestive health. Pumpkin is also rich in vitamin A, which is key for healthy vision, proper cell growth, and a strong immune system. Additionally, one cup of cooked pumpkin provides a third of the daily vitamin C requirement and contains B-complex vitamins such as folate, niacin, vitamin B6, thiamin, and pantothenic acid. That’s a lot of nutrients in a bowl of soup, not to mention the protein and iron found in the chicken! With regards to the shredded chicken, there are a few different options. You can either prep the shredded chicken ahead of time, which is my preferred method because then the meal is SUPER quick and easy. OR option #2 is you could use a rotisserie chicken if you’re really tight on time. OR option #3 would be to shred the chicken by bringing a pot of water to a boil and then placing the raw chicken breasts in the water for about 25-30 minutes or until no longer pink inside. Simply shred the chicken and add to the soup. Easy, right? Even though in the recipe instructions the garnishes are “optional,” they are HIGHLY recommended for optimal flavour. I used a half cup of cilantro, and a juice of one lime to flavour up the pot of soup. Then, I topped each serving with some diced avocado and additional cilantro. 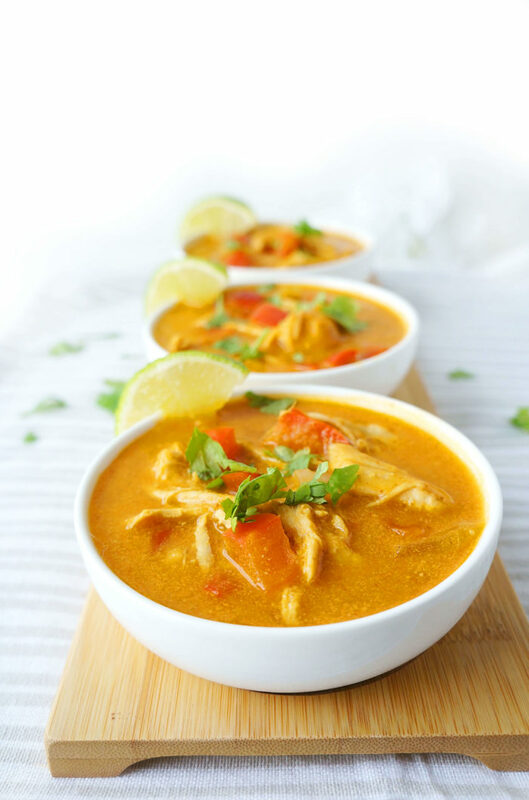 This soup pairs well with something that has a bit of crunch that can be used to dip into the soup or as a shovel to scoop up the chicken. I like to cut up a whole-grain tortilla or pita into wedges or strips, brush a little olive oil over top, and sprinkle with a bit of salt, pepper and garlic powder and bake for about 10-15 minutes or until lightly browned and crispy. It just tastes really good with the soup. That’s all I have to say about that. 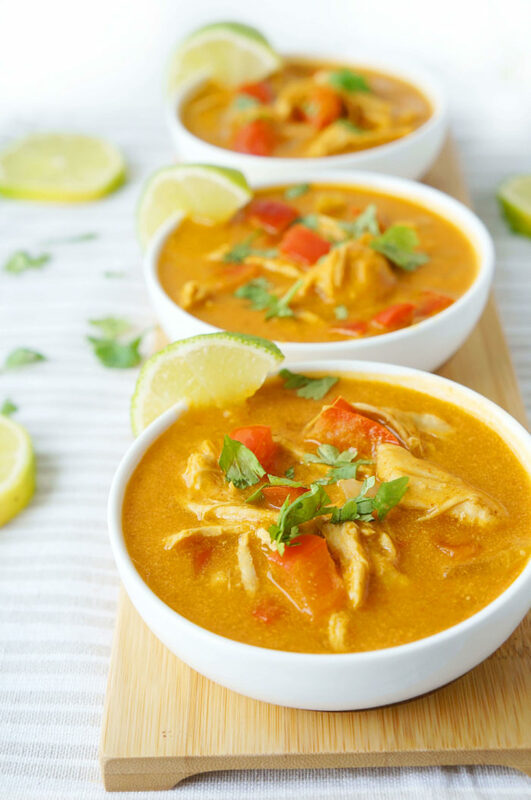 This pumpkin chicken soup is also a great recipe if you’re looking to do some meal prepping or batch cooking. Just double or triple the recipe and freeze the soup in individual containers or large ziploc bags for quick and easy future meals. This method of batch cooking makes life SO much easier! At the end of the day, this soup is seriously good stuff and I highly recommend that you try it out. In a large saucepan, add olive oil and cook red pepper, onion and garlic over medium heat for about 5 minutes or until vegetables are nearly tender. Stir in the next five ingredients (through to paprika) until smooth. Stir in the chicken. Bring to a boil, reduce heat and simmer uncovered for about 10 minutes or until heated through, stirring frequently. Season with salt and pepper, to taste. Just before serving, stir in cilantro. Serve with a squeeze of lime juice, additional cilantro, diced avocado and crispy baked tortilla or pita chips, if desired. 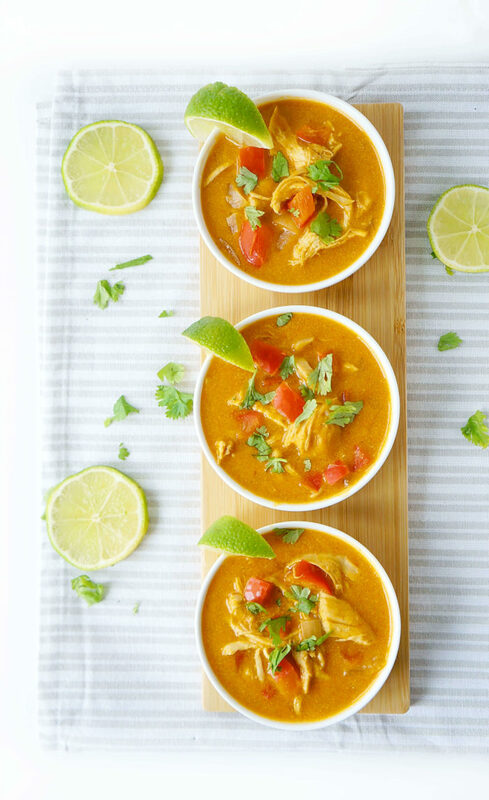 *I like to serve this soup with some crispy tortilla strips or pita chips. Simply cut up a whole-grain tortilla or pita into wedges or strips, brush a little olive oil over top, and sprinkle with a bit of salt, pepper and garlic powder and bake for about 10-15 minutes or until lightly browned and crispy. Serve along with soup.